"Citizen" Hogan, an exile Irish patriot, risks his life by returning to Ireland and helping a young couple. Small-town tramp befriends runaway boy. intertitle: [referring to Brandon] The roar of his father's dream - 'his' dream - for he too is helping to build it. 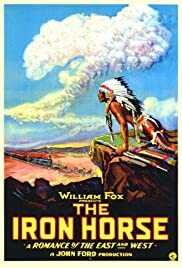 Since I live in Cheyenne, WY this type of movie really appeals to me. As all historians know, various towns along the route of this railroad (which coincides quite closely to interstate 80 in Wyoming) were made during its construction. Cheyenne and Rock Springs (because of its coal mining) were especially notable. I had seen this movie several years ago and was delighted to see it being broadcast on the Turner Classic Movies channel. Perhaps they will re-broadcast it again in the future. This movie, while not completely accurate historically, certainly gives an idea of the magnitude of the endeavor being undertaken. And it does feature a real locomotive which operated on the railroad during the period portrayed. Historical buffs definitely should not be swayed from enjoying this title simply because it may not strictly conform to history. I won't go into the story except to say that the various sub-plots keep the viewer very entertained. This was a very well-done movie in my opinion. Acting was very good. And the cinematography was very impressive. Fans of either westerns or silent-era films certainly should not miss this one.